Inspired by the exuberant rosé produced in the Marsannay-la-Côte region of France, this stunning realistic deep pink rose is absolutely gorgeous. We've featured this gorgeous queen of the garden, the rose, as the focal point of this silk flower arrangement, along with brambles of blackberries, red thistle flowers, delicate pink mums. The tones are deep apricot pinks, with reds. 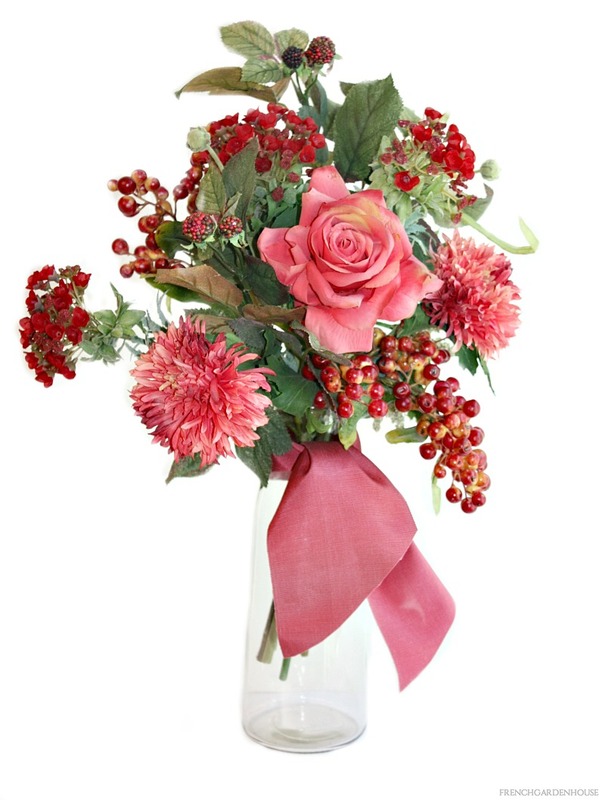 A hand picked wild look, pinky red berries and fluffy cypress add further depth and interest. Comes with our glass decanter vase, reminiscent of the wine decanter used in the wineries of the region, this is such a luscious array of flowers to display for those of you who decorate with the softer colors. Made to order, our luxury bouquet is hand tied, each will have a slightly different look. Comes with vintage ribbon as shown. This beautiful floral arrangement contains approximately 9 stems.